Anacapri is one of the two towns on the Island of Capri and is located at the foot of Mount Solaro. 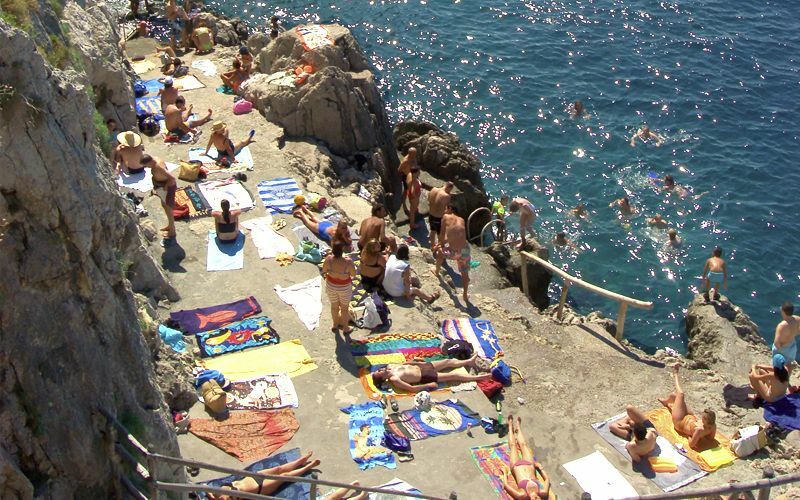 There are two places where you can swim nearby: the area near the Blue Grotto and Punta Carena, famed for its imposing lighthouse, one of the largest in Italy. 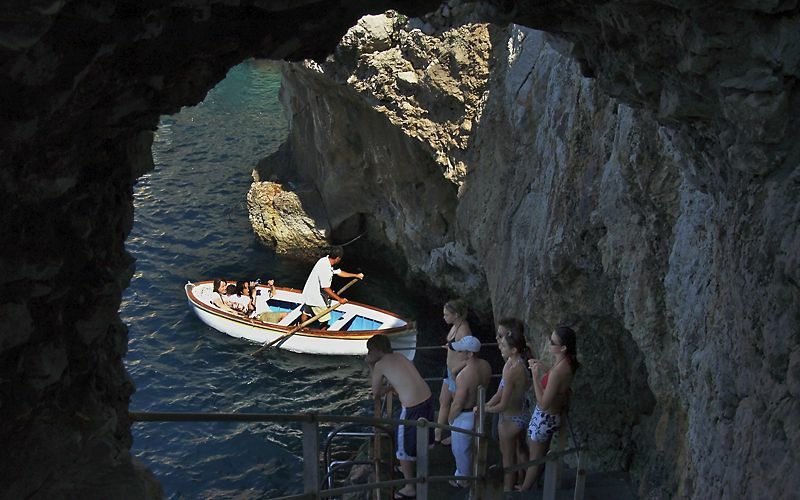 Near Anacapri, there are no sandy beaches, but instead dramatic rocky coves where the water is deep and bathers dive directly off the rocks or climb in using the ladders attached to the cliffside. 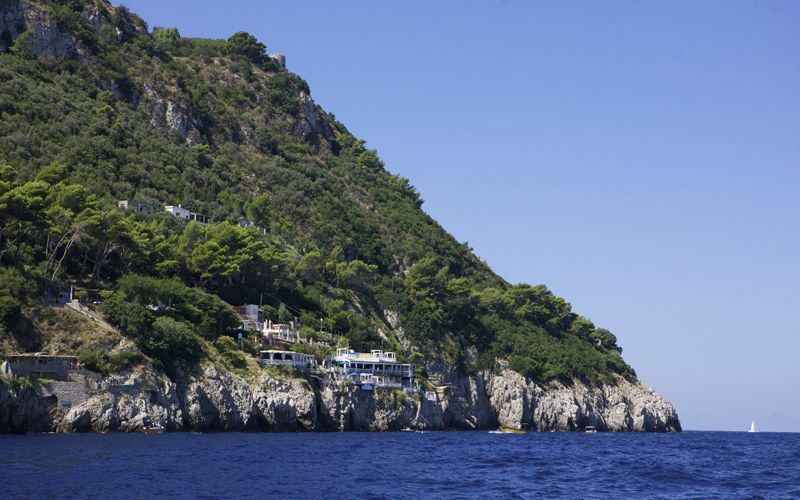 Take the bus from the Piazzetta in Capri town to the cemetary, getting off at the "Piazza della Pace" stop, which is the final stop on the line and serves both the Blue Grotto and the Punta Carena lighthouse. During the summer high season, buses run about every 20 minutes. 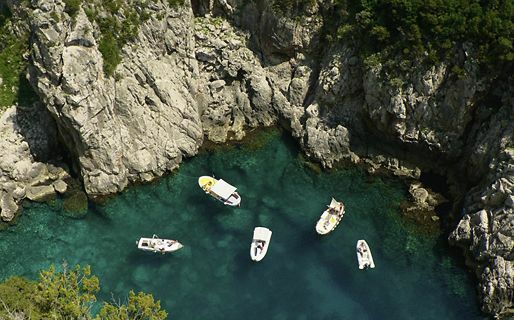 Near the Blue Grotto, you can swim at a number of different coves. The Gradola is the only free beach open to the public. 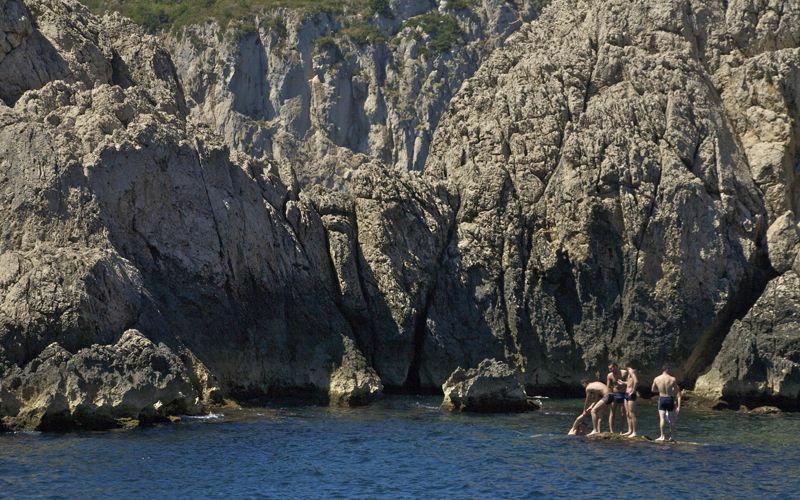 Here there are rocky terraces where you can sunbathe and two different ladders for climbing in and out of the water. To reach Gradola, take the stairs down from the bus stop and keep left, passing a number of restaurants. 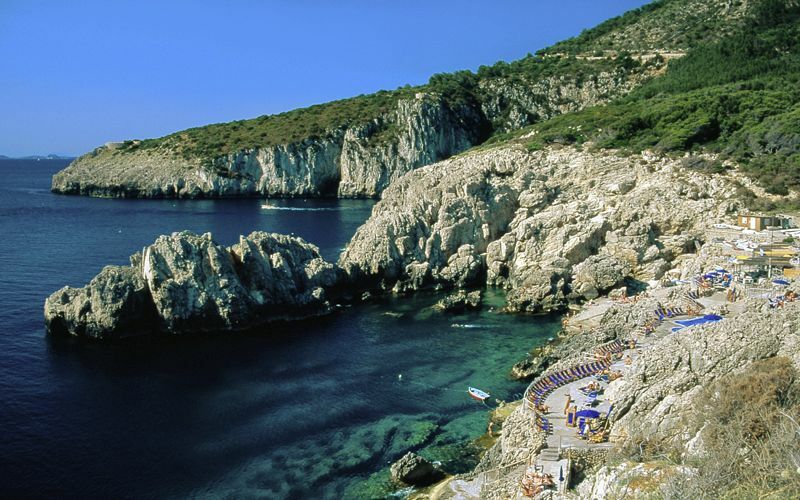 At the Blue Grotto, there are a few excellent snack-bars, restaurants, and beach clubs where you can relax and have a snack or meal, including Il Riccio, the Hotel Capri Palace's waterfront restaurant. Along the road to the Blue Grotto, you can stop for a few minutes to visit the Villa Damecuta (located about halfway between Anacapri and the Blue Grotto). Here there are the archaeological ruins of the Roman villa built by the Emperor Tiberius, and a lovely walk through the pine grove to the overlook above the Cala del Rio and the Gulf of Naples. 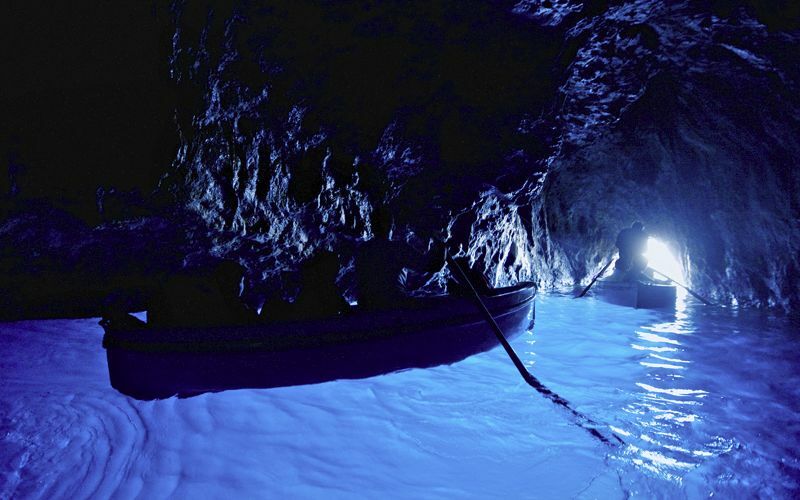 From here, you can reboard the bus towards the Blue Grotto (about 5 minutes away), or continue on foot (about 30 minutes). At the beginning of the lane to Damecuta, there is a small shortcut which is a bit rough but shortens the walk a bit. Wander the picturesque lanes in the historic center. Visit the residence of Axel Munthe. Reach the scenic overlook on Mount Solaro. 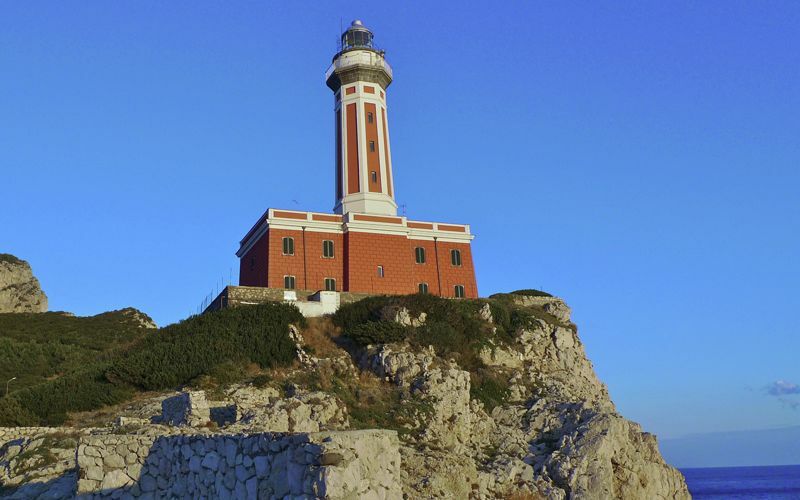 Punta Carena is the second spot near Anacapri where visitors can swim, which is also known as the "Faro" because of the imposing lighthouse which overlooks the bay. This is one of the few points on the island which gets sunlight until the sun sets over the Mediterranean, and, in the summertime, you can sunbathe here until the last rays disappear over the horizon. 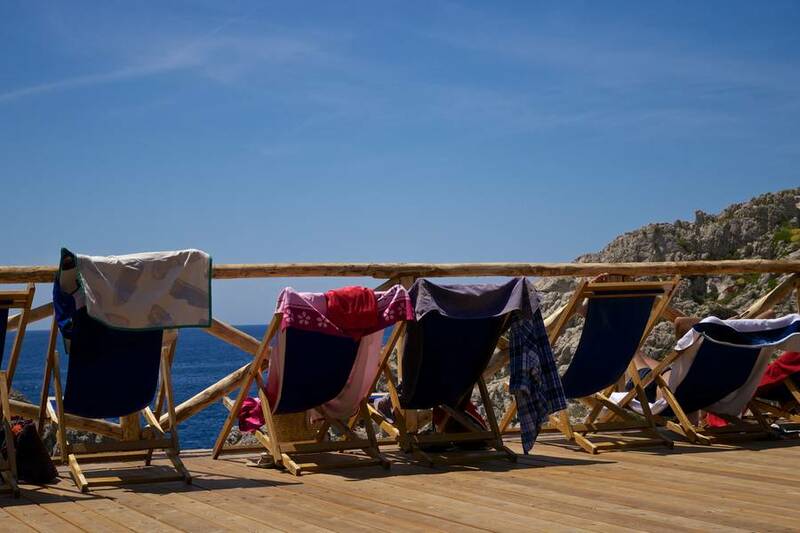 At the Punta Carena lighthouse, there's a rocky cove with natural terraces for sunbathing open to the public, and, adjacent, the Lido del Faro beach club offers a pool, sun deck, and excellent restaurant. It's the largest beach club in the area, and also has a snack-bar with a sun deck and loungers. Don't miss the traditional "caponata" at the Antonio snack bar, also known for his delicious sandwiches. 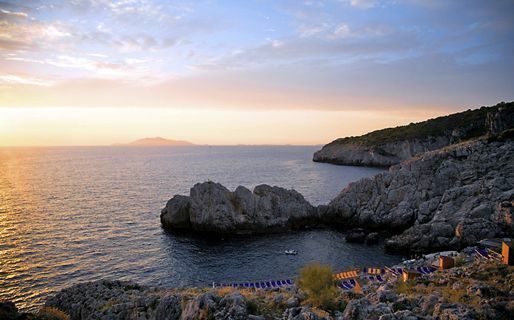 In the summer, the Punta Carena lighthouse is the most breathtaking spot on the Island of Capri for a sunset cocktail or a candlelight dinner for two. Along the route towards Punta Carena, you can get off at the Pino stop and walk (15 min.) 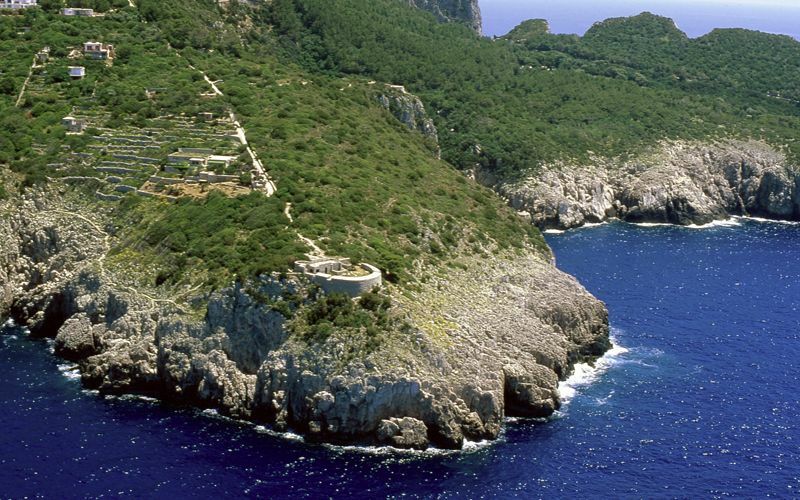 to the Fortino di Pino, one of the island's most important forts. This Trail of the Forts walking path continues down to the water's edge, though it is a tough climb back up during the hottest hours of the day. Otherwise, along the road to the Pino fort, take the path to the left about halfway down for the shorter walk to the Fortino del Tombosiello, a smaller fort but with a gorgeous view over the Cala di Limmo and the Punta Carena lighthouse. Retrace your steps back up the lane and continue to the lighthouse (15 min.) along Via dei Vecchi Ginepri, a shortcut through a lovely, cool pine grove. Punta Carena and the Blue Grotto are joined by the Fort Trail, an unforgettably scenic route which is quite challenging during the hot summer months. If you plan to hike this route, which lasts between 3 and 4 hours, make sure the bring plenty of water, a sun hat, and comfortably walking shoes (not sandals or flip flops! ).